Update....This morning we found out that Cohen and Sophia posted bail and are coming home!!! They will be coming home with monitors, which is not a big deal, especially after all the helpful comments. We will both take infant CPR tomorrow and do "Care by Parent" for 24 hours. We will stay in a room on the same floor as the NICU and take care of the babies as if we were home. This is the test to see if we cut it as padres. If we pass our test, we get to keep the babies and bring them home Wednesday! Cohen and Sophia took their car seat test (60 minutes without crazy vital signs) today and passed with flying colors on the 1st try! 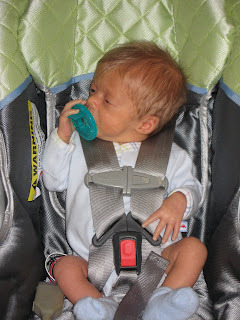 In fact, Cohen passed with the color brown as he had his 1st blow out in his car seat - it is now officially broken in. Mari is off to the Fire station tomorrow morning to have the car seat bases installed properly. 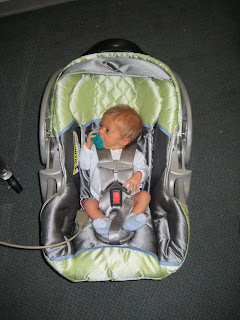 I placed the seat protectors on the seats, put the bases in the car, and stroller in the back. We put together one swing and 2 bouncy seats this evening as well. And believe it or not, not a single fight the whole time! Things are defintiely getting real! I think I felt butterflies today for the 1st time. We hope to post soon if our eyes can stay open long enough. Get some sleep. Rest in His arms, and enjoy the wonder of what God has and is doing in your lives. Tears of joy are in my eyes for you! Where do I sign up to help with those precious ones??? Joshua 1:9 "Be bold, be strong, for the LORD IS with YOU!!!! Congratulations! That is so awesome. Good luck and let the fun begin! CONGRATULATIONS - What great news to start the day with.....I am so happy for you. I found your blog off of another blog, and I have been reading it daily hoping for an update. I am so happy for you getting to bring 2 of them home this week. Our oldest son was only 4 weeks early, but stayed in the NICU 15 days, the day we thought he would come home we were told he had an apnea episode and had to stay an additional 7 days. He was on a heart monitor for 4 months as well. 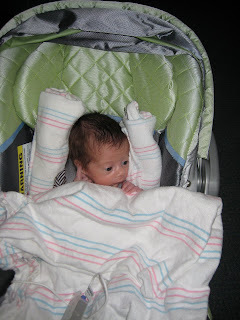 That is awesome they passed the car seat test on the 1st try, we were told that was the biggest hurdle to get over to get them home once they could eat and hold their temps. 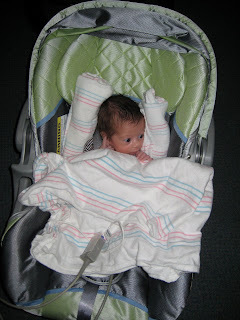 i have been checking in on your blog to see how those little ones are! You have my prayers from New York! I love all the hair on the precious babes! How exciting to bring two home. I have never known or heard of anyone "failing" the "in room" overnight test, so I hope it goes well. Heck, you managed to assemble a swing, bouncy seats and install carseats...THAT's an A+ for Dad! Love the blog updates and the "for real" anxieties that go with every day life. You're doing tops! Congrats! I am so very excited for all of you!! God has blest you with such a wonderful family!! I am so excited to meet the babies. Please let me know what I can do to help out. I have become a pro at putting together and setting up baby "stuff." I am ready to hold a baby or two when the time comes!! Mari, you had me in tears when I read the previous blog about the girddle!! I did the same thing after the twins were born!! You have quite an inspiring attitude about life with a girddle!!! Whoopee!! Way to go Goerlichs. I am so thrilled for you to be able to bring Cohen and Sophia home. Won't be long before Noah and Finn can come too. By that time, you all will be so expert at parenting, you'll be able to fit the other two in the schedule. Im ready to come hold, feed and cuddle, and of course change diapers. How do I sign up for a shift? Let me know. Love and hugs to you all. God has truly blessed you with this speciall challenge.